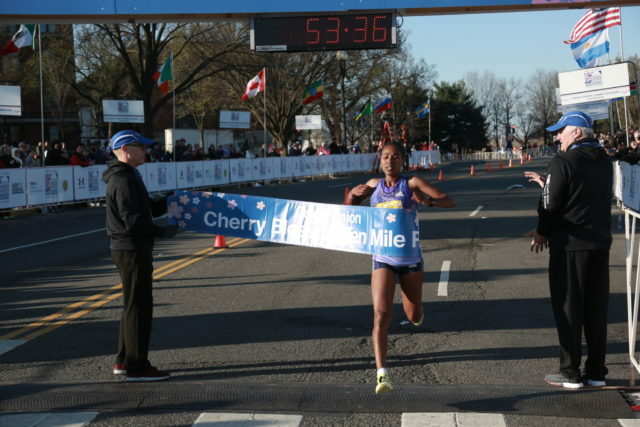 For the second straight year, a Kenyan-American runner won the Credit Union Cherry Blossom Ten Mile, this time Stanley Kebenei, running 46:36 to edge Kenya’s James Kibet by three seconds. Kebenei’s time ranks as the fourth-fastest American men’s 10 mile. Kebenei is also a cousin of Kenyan Stephen Sambu, who won the race in 2014 and 2105. The race course was 10 miles this year, and winds were well short of the nearly 50 mile-per-hour winds. On the women’s side, 21-year-old Ethiopian Hiwot Gebrekidan won in 53:37 over countrywoman Buze Diriba’s 53:52, on the strength of a 4:40 mile starting in the seventh mile. Gebrekidan was unavailable for comment following the race. Kebenei thought he could have blown up a pack of 11 in the eighth mile, by dipping into 4:20 pace, but thought better of upsetting the status quo. Kibet thought otherwise, and with a roughly 1.5 miles to go, moved ahead, but Kebenei was confident he could track him down. Tara Welling, 27, primarily a track runner for Portland, Ore.’s High Performance West, used Cherry Blossom as her first race after recovering from a December injury and ended up the first American woman, running 55:34 seventh place. After the pace picked up in the second half, she found herself alone, slightly ahead of Saratoga Springs, N.Y.’s Hannah Davidson and trailing two women. Davidson, 26, closed out her season in ninth place (55:59) for her first 10 mile race, and as the second American finisher. Ryan Mahalsky, 23, an Arlington resident who runs for the District Track Club, was the top local man in 15th, running 48:26. Reston’s Susanna Sullivan, 26, of the Capital Area Runners, was 10th in 56:12.